/ Best Calzone in Destin FL / LIVE MUSIC! 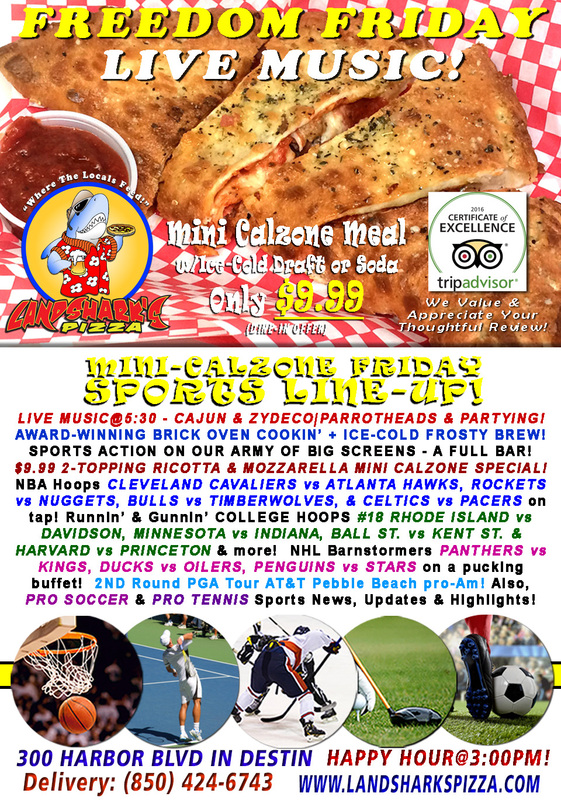 Boudreaux & Parrotheads FREEDOM FRIDAY TWO-TOPPING CALZONE & Brew $9.99|CAVALIERS vs HAWKS & Party 5:30PM! LIVE MUSIC! Boudreaux & Parrotheads FREEDOM FRIDAY TWO-TOPPING CALZONE & Brew $9.99|CAVALIERS vs HAWKS & Party 5:30PM! 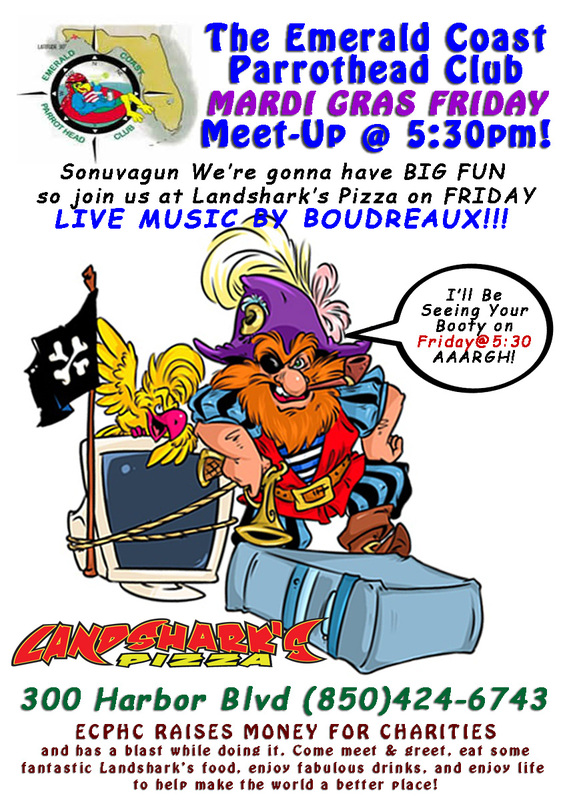 LIVE MUSIC@5:30 IN DESTIN AT LANDSHARK’S – FEATURING THE CAJUN & ZYDECO STYLINGS OF BOUDREAUX ON STAGE! Sonuvagun we’re gonna have BIG FUN on the Bayou, baby! Gather round Jimmy Buffet fans & Party for a Purpose at 5:30 today when we do our thing to raise money while having a great time – MUSIC, DANCING & FUN: THE THEME: MARDI GRAS!!! 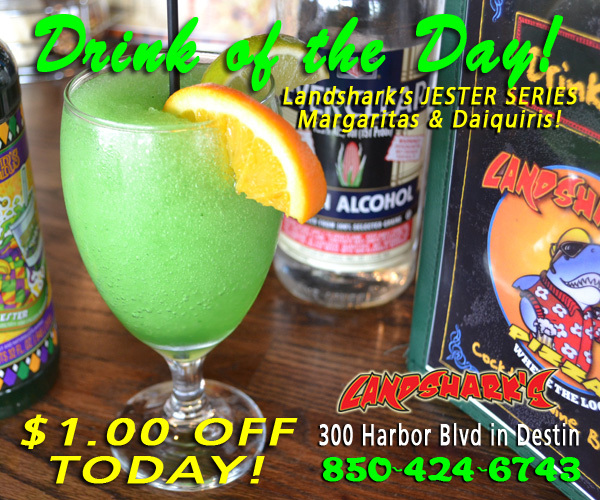 LANDSHARK’S DRINK OF THE DAY – $1.00 OFF our delicious JESTER MARGARITA Cocktail! 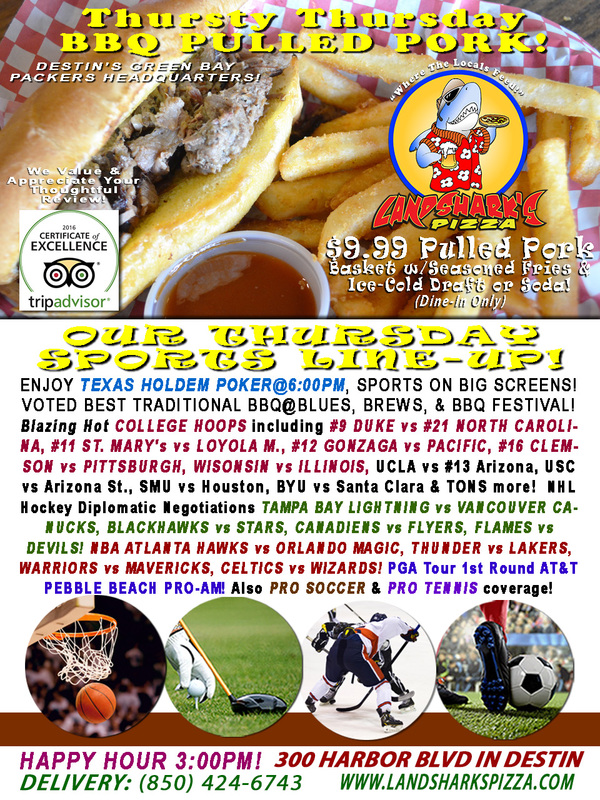 SPORTS ON OUR ARMY OF BIG SCREENS – Exciting NBA BASKETBALL featuring CLEVELAND CAVALIERS vs ATLANTA HAWKS, ROCKETS vs NUGGETS, BULLS vs TIMBERWOLVES, & CELTICS vs PACERS! NHL Barnstormers PANTHERS vs KINGS, DUCKS vs OILERS, PENGUINS vs STARS, FLAMES vs RANGERS, Blues vs Jets, Red Wings vs Islanders, Capitals vs Blue Jackets & Canucks vs Hurricanes on a pucking buffet! College Hoops #18 RHODE ISLAND vs DAVIDSON, MINNESOTA vs INDIANA, BALL ST. vs KENT ST. & HARVARD vs PRINCETON & more! 2nd Round Excitement PGA Tour AT&T Pebble Beach pro-Am! Also, PRO SOCCER & PRO TENNIS coverage plus plenty of other Sports Broadcasts, Sporting News, Analysis, and Commentary! Pro Tennis This Week: ATP Open Sud de France, ATP Ecuador Open Quito, & ATP Diema Xtra Fofia Open (all Feb 5-11th). Idunno who let the dogs out, but woof, woof, woof, woof woof – Yeah, we’ve got a Four-Footed Friendly Area For your Furry Friend! 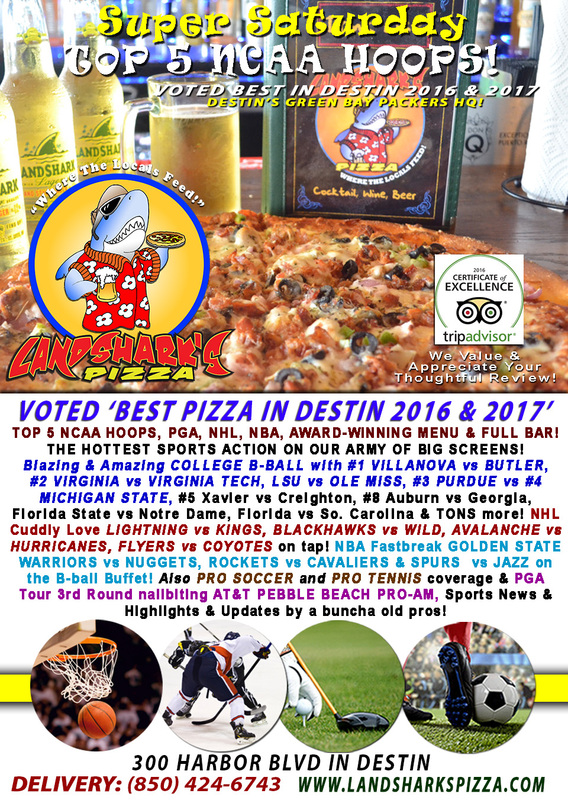 Previous Post: « Landshark’s DUKE vs NO CAROLINA NCAA Action-Fest! BEST Traditional BBQ in Destin & Brew $9.99|TEXAS HOLD’EM POKER 6PM!